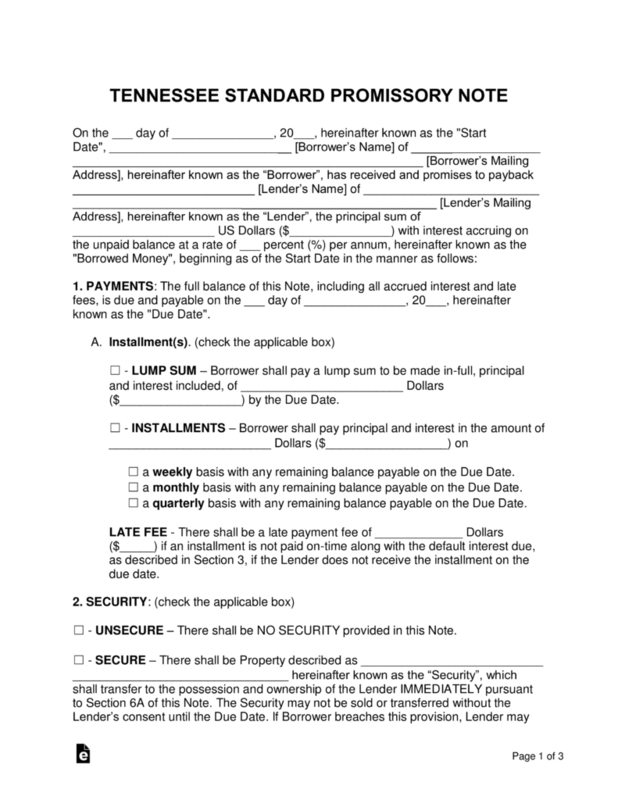 The Tennessee promissory note templates are signed promises stating that the borrower of a monetary balance will reimburse the lender of said balance in the time frame established in the template. The parties also agree on the interest rates incorporated into the transaction. It is important that the interest rate chosen is legal in the state of Tennessee; head to the bottom of this page for information regarding legal interest rates. Secured Promissory Note – Secures the lender’s loaned money by ensuring he or she receives a physical item (from the borrower) in the case of a default to help recover the borrower’s unpaid balance. Unsecured Promissory Note – This template does not include a section on security. This can result in the lender losing the loaned balance if the borrower defaults on the note and cannot recover. The lender can help remove this risk by screening all potential borrowers and by working with family and friends.